The ECOsmarte system creates two sanitizing agents, copper ionization and liquid oxidation. As water flows from your pump back to your pool it travels through the ECOsmarte ionization/oxidation chamber. 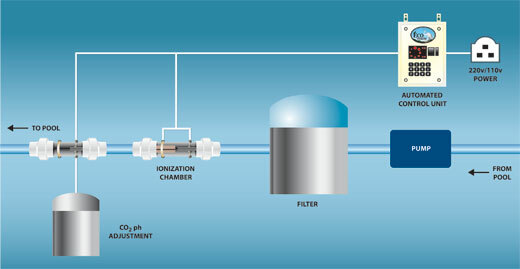 While in the chamber, the water will either receive copper ions or become oxygenated depending on the setting of the switch on the controller. 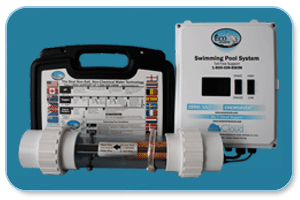 Both the ionization and the oxidation sanitizes your pool water, killing bacteria, algae, and viruses. It is simply the best chemical-free method to sanitize your pool water. Copper ionization was developed in 1967 for the Apollo Space Program to insure safe drinking water and to control scale in cooling systems during space missions. 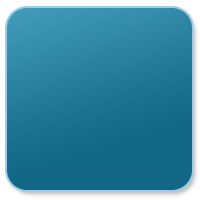 The ECOsmarte System incorporates this same technology. The copper ions created by the ECOsmarte System are safe and essential for humans, plants and animals, but are lethal to bacteria, algae and some viruses. By adding these ions to your pool or spa water, the ECOsmarte System basically kills bacteria, algae and certain viruses and prevents them from growing in the water. Copper ions are only added to the water for a few hours each week in swimming pools and only a few minutes each week or month in spas. The residual sanitizer in the water, produced by the ionization process, is recognized by the National Sanitation Foundation (NSF) and the U.S. Environmental Protection Agency. Because both copper ionization and oxidation is natural, there will never be any chemical backwash. Making it safe for the environment to drain and backwash your pool. ECOsmarte�s proprietary non-chemical method of oxidation is what separates it from other chemical reducing water purification systems on the market. Oxidation is achieved by water passing through the chamber while low voltage electrical current is sent to the coated titanium plates in the chamber. While in the oxidation mode, a proprietary process of electrolysis causes the electro-physical separation of water into oxygen and hydrogen. This separation forms free oxygen atoms and hydroxyl radicals (OH). This proprietary process creates a combination of the most powerful oxidizers available for water disinfection. the dominant form of chlorine. sanitizing systems. 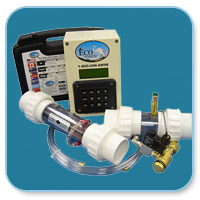 ECOsmarte leads the world in automated Ph control without acid using liquid CO2. In 2014, the Digital Programmable model was WIFI enabled.